An exhibition marking Dwight D Eisenhower's connection with Culzean Castle in Ayrshire has been put into storage. An Ayrshire castle that was once known as the Scottish White House is in danger of losing its presidential connection, according to locals. 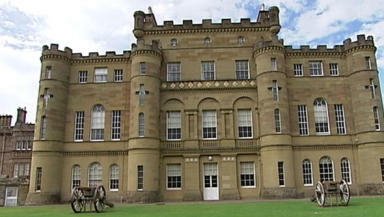 Following the Second World War, General Dwight D Eisenhower – who would go on to be the 34th President of the USA – was gifted a guest flat on the top floor of Culzean Castle as a gesture of gratitude for American support during the conflict. Eisenhower and members of his family stayed at the castle on several occasions, and he also lent the flat to friends. However, an exhibition of artefacts about Eisenhower's visits to Ayrshire has been put into storage and replaced with a virtual version after the National Trust for Scotland said the exhibition needed a more modern look. Locals are now campaigning for the original artefacts to be put on public display elsewhere in the castle or released to the community. A National Trust spokesperson said they are committed to ensuring the Eisenhower Connection is not forgotten. The spokesperson added that the Trust is now looking into using the artefacts in a new exhibition about the life of the castle in the 20th century.